Gedatang 疙瘩湯 is a Northern Chinese (like Beijingnese) speciality. Many eaten this for breakfast or comfort noodle type soup. 疙瘩 ‘ge da’ has various meanings in Chinese like a knot on a rope or some skin problems like warts, lumps or pimples. I have no idea why this soup has such ugly name, maybe due the the tiny nobbly shape of the dumplings. Most common gedatang is with egg and tomato. In Chinese this is called 西紅柿雞蛋疙瘩湯 ‘xi hong shi ji tan ge da tang’. It’s kind of like tomato and egg drop soup but more substantial, similar to rice soup. For 2 large bowl of soup, this is what you need. about 250g ripe tomato, skinned if you preferred then cut into bitesize. First make the geda dumplings. Put flour in a mixing bowl, using a spoon drizzle water bit by bit into the flour while stirring with a pair of chopstick. Keep mixing and stirring till the flour turns into tiny bits of dough, loosen and not clumped together and there is no dried flour left. If the dough does clump together, don't panic, sprinkle on a bit more flour and snip the dough up into tiny pieces with scissors. 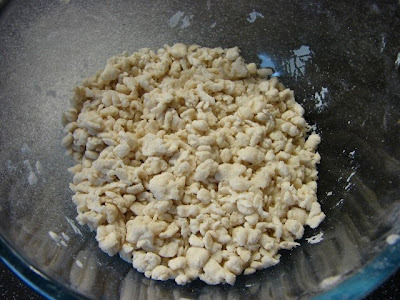 The mixture will end up like this picture below, these geda dumplings are around or smaller than pea size. Heat around 1 tbsp of oil till very hot then pour in the beaten egg and keep scrambling till the egg is set and slightly brown. Take the scrambled egg out and add more oil and stir fry the tomato till a bit mushy. Add stock and seasonings to taste, then add in the eggs. When the liquid is rapidly boiling, add in the tiny bits of dumplings. Let this cook at high heat for about 60 - 90 sec and turn the heat off. Do not cook the dumplings for too long or they will swell too much and making the soup too gloppy. Add in the spring onion, coriander and sesame oil. Ready to serve. Wow, I've never heard of this. Definitely one to try! I made spaetzle before but not like this. I think I made the German version where you have to push the batter through something to get the shapes. To be honest it was a bit of a nightmare! This looks like a much easier method. Hi! Can you post recipe of eggs + tomatoes + garlic ... and something else. We tried them in China. Its some kind of scramble eggs with tomatoes and garlic... But we don't know how to cook them. Thank you. Ok when I find some nice red juicy tomatoes I will make this stir fried egg and tomato and post it. 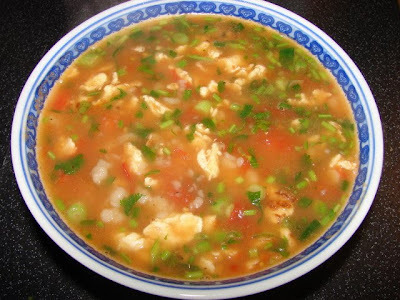 I have not heard of making this soup with scrambled eggs, we usually drizzle the egg in at the end, after the "lumps" are done cooking, like egg drop soup style. The way my parents make this dish does not include coriander or sesame oil, but instead uses the simple flavor of green onion, fried, then stir fried tomato. We stir fry the tomato, then when it is soft we add water, then bring to a boil, put in the lumps, boil it until they float, then turn off the heat and drizzle in beaten eggs egg drop soup style. Then we put the lid over the wok for a while.